CyberHobby has produced a series of 110 C/D aircraft and this adds to their growing catalogue. 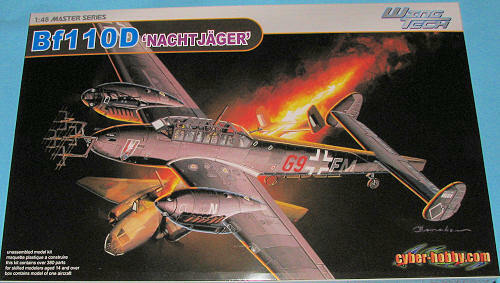 Like others, it is based on Dragon's superlative 1/32 Bf-110 and they have chosen the night fighter version for this particular kit. Not surprisingly the quality of the moldings is world class and the detailing is everything you'd expect from CyberHobby/Dragon. 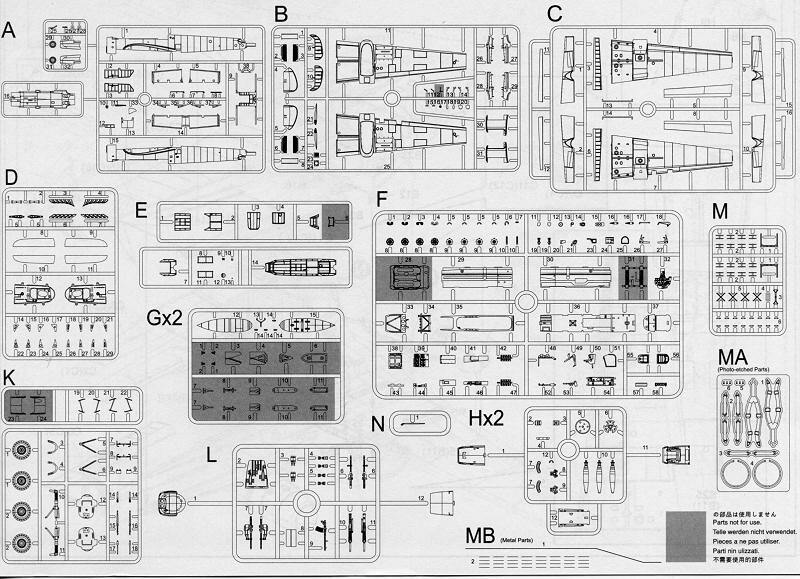 The kit includes a ton of detailing in the 380 parts included in the kit. Though I've listed all the details below, a few things really struck me. One is that you don't have to build it with everything out in the open as you would with the Eduard kit. CyberHobby has provided a one-piece canopy in addition to the multi-piece version. The nose can be built closed or with the ability to show off the gun compartment. Same with the engines. Two types of drop tanks, a real wire HF radio antenna for along the side of the fuselage and a small P.E. fret for the antenna stand-offs, seat harnesses, and DF loop antenna. You also get a bag of small metal 'spikes' for the ends of the radar antenna. As you can see on the box art, this is a rather complex arrangement. A superbly detailed interior and much more as listed below. By the way, the smaller tail wheel and tail section for the earlier planes is not in this kit so you can only do a 110D. The decals are superbly printed and include a full stencil suit. Those wanting something different will find several aftermarket sheets with 110D markings on them, but the kit decals should perform very well. This is another excellent addition to the 110 field and I'm sure that we will be seeing other variants being produced later on. My thanks to www.dragonmodelsusa.com for the preview kit. Get yours at your favorite retailer or have them order it for you.